← Yeast for Valentine’s Day? – Yeasts produce rose-like aromas to woo insects. Man and yeast have crossed their paths long time ago. Evidences of deliberated control of the process of winemaking in the regions of Caucasus and Mesopotamia go back as far as 7000 B.C. (McGovern et al., 2004). Since then, man developed and mastered several processes where yeast plays a major role and that greatly influenced the course of mankind such as bakery or brewing. For a long time, these processes were not completely understood, however, during the 19th century, Louis Pasteur was able to prove that yeast was the one responsible for transforming sugar into alcohol (Pasteur, 1858). This represents a landmark in the yeast world, when not only man began to better understand yeast as a microorganism, but also to develop tools and optimize biotechnological processes to take advantage of yeast abilities. An ability that has been appreciated since early times is the production of compounds of interest and the control of their production. In this field, a particular group made a discovery that will probably leave a footprint in biotechnology. Song et al. 2014 showed that it is possible to control the rate of yeast (Saccharomyces cerevisiae) glucose consumption as well as the production of end-products, such as ethanol or ATP, by simply applying a gating voltage (VG). The way how this was achieved was by constructing a transistor-like device where yeast is immobilized in a graphite electrode and connected to an insulated gating electrode. This electrochemical cell is in contact with a glucose solution and by applying a VG to the system, the kinetics of the mentioned substances can be completely controlled. A schematic representation of the experimental design, based on a three-electrode system, can be seen in Figure 1. The authors started by verifying that in fact the oxidation current measured was taking place at the yeast-immobilized electrode (also called working electrode). Only in the presence of yeast and glucose considerable oxidation currents were verified which in turn would be amplified when applying a positive VG. To go even further, glucose concentrations in solution were measured when applying different VG ´s (Figure 2.). With only yeast and glucose (curve 1) and therefore VG=0, relative slow glucose consumption was verified. However, when applying a positive VG, the rate of glucose consumption was considerably increased (curves 2-4), depending on the VG applied. When reversing the polarity of the VG, the opposite was verified. Glucose consumption slows down to levels below curve 1. The same result was verified by applying rotenone, an electron transport chain inhibitor, instead of VG (curve 9). The authors proceeded by testing if the same kind of kinetics could be verified concerning end-products of yeast glucose metabolism. For that, glucose and either ethanol or ATP were measured simultaneously in the same sample and their concentration was determined (Figure 3). Applying the same conditions as in the previous experiment (different polarity and intensities of VG), the authors verified a high correlation between glucose consumption and ATP and ethanol production. With positive VG, glucose consumption was increased as well as ATP and ethanol yields. With reverse VG, the glucose consumption slowed down and the end product concentration was decreased comparing to VG=0 (Figure 3). Taken these results together, the authors were able to clearly show that VG controls the glucose consumption and the production of ATP and ethanol, demonstrating that the kinetics of these substances can be fully controlled by electrostatic means. Despite the clear evidence between VG and glucose metabolism in yeast, up to now there does not exist a confirmed model or an unequivocal mechanism description that elucidates the observed effects. Notwithstanding, the authors proposed a plausible explanation for the results observed. It had been previously shown that a VG can be used to control the electron transfer between a redox enzyme (microperoxidase-11) and an immobilized electrode, resulting in the reduction of H2O2 (Choi and Yau, 2011). This fact would be due to a modulation in the electric charge distribution that ultimately would alter the electron tunnel barrier affecting electron flux and enzyme activity. In the case of the present work, this could be applied, for instance, to the redox enzymes involved in glycolysis which by having their effective height of the tunnel barrier modulated, depending on VG intensity and polarity, would increase or decrease the electron flux and in this way the glucose consumption. The same can be thought for similar enzymes involved in ATP and ethanol production. 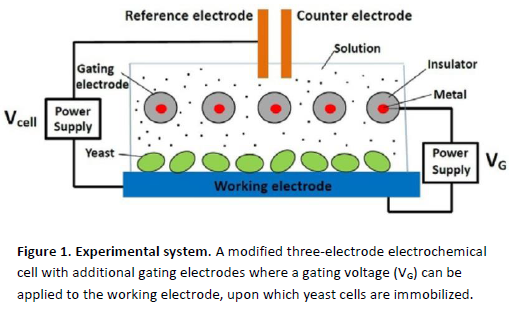 With this work, the authors were able to prove that it is possible to control the kinetics of glucose consumption and metabolism end-products such as ATP or ethanol by applying a VG to an electrochemical circuit were yeast is immobilized in an electrode. Although only recently discovered, these results might represent a considerable breakthrough both in biotechnology/yeast applications and scientific knowledge. Firstly, if we will be able in the future to control the kinetics of yeast metabolites and other products by simply regulating voltage, many improvements and benefits could be reached. It could also enable the production of compounds that are difficult or expensive to synthesize at present. The yield of more common products might as well be increased. Furthermore, knowledge about yeast metabolism will certainly be generated. As the authors suggested, these discoveries might be particularly useful in cancer research for instance. It is known that cancer cells consume glucose at a much higher rate and that this is related to the turnover time of redox reactions. In this way, new insights might be obtained regarding this subject. Choi, Y., and Yau, S. (2011). Field-controlled electron transfer and reaction kinetics of the biological catalytic system of microperoxidase-11 and hydrogen peroxidase. AIP Adv., 1, 042175. McGovern, P. E., Zhang, J., Tang, J., Zhang ., Hall, G. R., Moreau, R. A., Nunez, A., Butrym, E. D., Richards, M. P., Wang, C. S., Cheng, G., Zhao, Z., and Wang, C. (2004). Fermented beverages of pre- and proto-historic China. Proc. Natl. Acad. Sci. U S A 101 17593–17598. Pasteur, L. (1858). Nouveaux faits concernant l’histoire de la fermentation alcoolique. Annales de Chimie et de Physique, 3rd Series. 52, 404–418. Song, Y., Wang, J., and Yau, S. (2014). Controlled glucose consumption in yeast using a transistor-like device. Scientific reports, 4, 5429.